Through Continental's own Cruising Chauffeur function, the two vehicles will be able to take over driving tasks on various roadways in accordance with traffic regulations. WINDSOR, Ont. -- Two autonomous vehicles owned by suppliers Magna and Continental crossed an international border between Canada and the United States on Monday, testing automated driving technology in a variety of settings. The drive also highlighted a new memorandum of understanding between Ontario and Michigan, which, together, will help develop more autonomous vehicle technology and testing. The vehicles, owned by Magna International and Continental, started their journey in southeast Michigan before a trip through the Detroit-Windsor Tunnel that connects Detroit, Mich., and Windsor, Ont. They then travelled onward to cross the Bluewater Bridge, which connects Sarnia, Ont., and Port Huron, Mich. From there, they will travel about 500 kilometres to their final destination, Traverse City, Mich., where industry leaders have gathered for the annual Management Briefing Seminars run by the Center for Automotive Research. MDOT director Kirk T. Steudle called it an “unprecedented collaboration between two nations and private industry." “There will be a lot of testing done before we put these things on the road and what this memorandum does is allows us to engage in that activity officially,” said Tom Toma, global product manager at Magna Electronics. The State of New York is also is accepting applications from companies interested in testing the vehicles through a year-long pilot program, announced May 10. “We’re open-minded with respect to working with all jurisdictions,” Del Duca said. Each supplier was testing some of its own technology used to make Level 3 autonomous driving possible. Level 3 autonomous driving still requires a driver be at the wheel of the vehicle, ready to take control at a moment’s notice. Through Continental’s own Cruising Chauffeur function, the two vehicles are able to take over driving tasks on various roadways in accordance with traffic regulations. 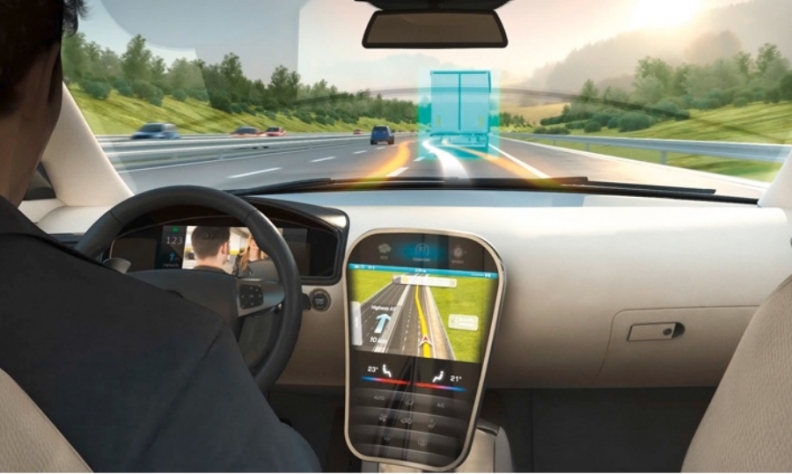 Once Cruising Chauffeur is activated, data analyzed in a central control unit called Assisted and Automated Driving Control Unit (ADCU) is used to generate a 360-degree model of the vehicle’s surroundings. “I would see this as more opportunities,” Continental Project Lead Steffen Hartmann said of the memorandum of understanding. “Michigan and Ontario have completely different roadways and [differences] in how traffic behaves. It’s a good opportunity for us to develop the system in different environments. In combination with a high-resolution map, Continental’s system recognizes all moving and static objects, as well as the layout of the roadway ahead. The drive demonstrated how the vehicles’ multiple camera, radar and LiDAR sensors interact while being driven underwater through the concrete Detroit-Windsor Tunnel and across the steel Blue Water Bridge. Continental confirmed to Automotive News in May that it was conducting road tests in Ontario and housing the vehicles in their garage in Auburn Hills, Mich.
“Continental has been testing automated driving on public roads for more than five years and our approach is a global initiative. The engineering teams are spread across locations in the U.S., Europe, China and Japan to ensure driving and safety functions can be easily adapted to the individual regions as one comprehensive team effort,” Jeff Klei, President, Continental North America, said in a statement. Both Michigan and Ontario have taken steps to ensure the region remains competitive as the automotive landscape evolves. In 2016, Mich. Gov. Rick Snyder signed a package of bills enabling automated vehicles to operate on roads across the state. That same year, Ontario became the first province to set a regulatory framework to permit testing of automated vehicles, making it the only province to have an automated vehicle pilot program in Canada.